Create the European City of Tomorrow and support artists’ implication in urban tranformation projects. Within the framework of the e.city – Europe project, Apollonia and its partners offer to the city of Strasbourg a series of events taking place in November-December 2013. They will be related to questions of artist residences, but also the role of artistic creativity in the transformation process of our European cities. E as Europe, E as exchanges, E as urban environment… For several years, Apollonia invites and presents each year in Strasbourg a European city through the most dynamic and unique aspects of its culture. The e.city project focused on the cities of Istanbul, Budapest, Gdansk and more recently Rethymno. For the 2013 edition, Apollonia wishes beyond national considerations when opening a broad European debate raising questions which became crucial in the definition of cultural policies of a country. Our urban landscapes tangle, stretch, blurring pins, identities and territories. Altenately source of conflicts and creator of new urban functions and citizens. In the living fabric that represents the city what is the role of creation? Can artists and citizens orientate and influence the urban change in the future?What could the artists’ look bring to the city? To address these issues, a conference centered on the theme “The City of tomorrow, with or without the artists?” will be held on 26 November 2013 in the Council of Europe building. A team of urban planners, essayists, artists and representatives of institutions will be established to provide a wide range of different positions of the actors in our future cities. 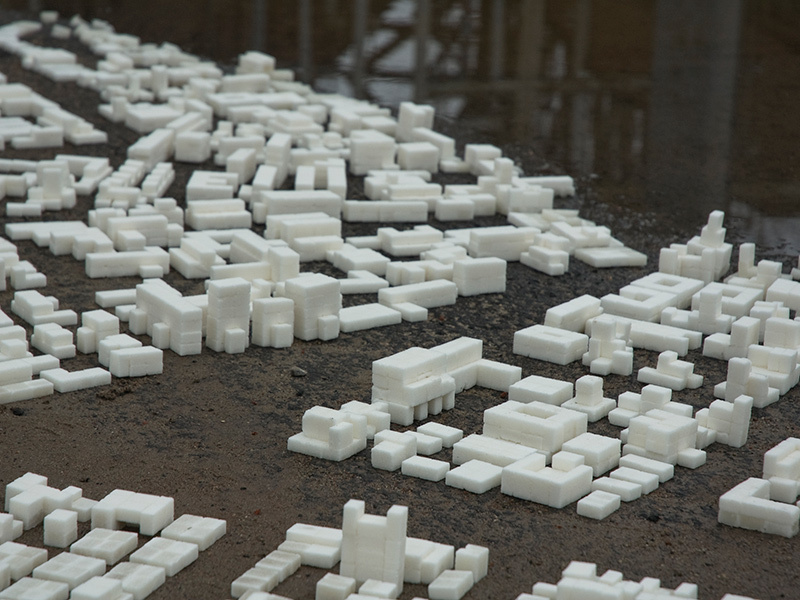 Meanwhile, Apollonia and the FRAC Centre will present the work of architects and artists having reflected upon the city, housing and the environment over the past six years within an exhibition entitled Artecitya, from 15 November to the 1st of December 2013, at “12 rue Faubourg de Pierre” exhibition venue in Strasbourg. An artist’s intervention in the city and two workshops will also take place during the months of October to December. The intervention of Laurent Reynes (architect, doctor art lecturer at the ENSAS, artist and sculptor), “Constructions abstraites : e.toile”, will take place on the front of the Council of Europe in Strasbourg. The temporary rehabilitation of the facade of this iconic venue will enable a new view of the building, whether artistic, symbolic, practical and so on. The workshops led by the artist and teacher (founder of WOS / agence des hypothèses) Claire Dehove and the artist Alain Bublex, will connect the students of the National Architecture High Schoolof Strasbourg (ENSAS), the High School of Applied Arts of Strasbourg (HEAR / ENSADS) and those of the Master course on Art Criticism of the University of Strasbourg. Futhermore, a publication ans a Student’s Blog will be create for the whole of events.